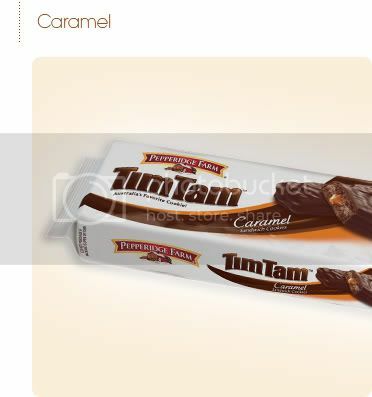 After my review of the classic style Pepperidge Farm Tim Tam several people wrote in comments that while I thought the Arnotts version is better they couldn't tell a difference or preferred the Pepperidge Farm. Well they will either be really happy or really sad to know that I LOVED the Caramel Tim Tams! Basically it's the same cookie- two chocolate biscuits that have a chocolate creme sandwiched between the two and then the whole thing is enrobed in more chocolate. The chocolate is still on the sweet side but it is quite smooth and has a nice melt to it. In this version, the caramel lays below the first biscuit gently resting atop the chocolate creme. The caramel doesn't have the strongest flavor. It's not overly buttery or rich BUT what it does add is some great chewy texture. It's the contrast of the cool chocolate, the crunch of the biscuit and the sticky caramel that made the cookie for me. I may not go out of my way for the normal Pepperidge Tim Tam but I will be buying more of these! I read in the Pepperidge website that it's available for a LIMITED TIME only in Target. Why not year-round?